The 4 July discovery announcement makes it clear that the new particle is consistent with the long-sought Higgs boson. The next step is therefore reasonably obvious. Physicists involved in the ATLAS and CMS detector collaborations at the LHC will be keen to push ahead and fully characterize the new particle. They will want to know if this is indeed the Higgs boson. I mentioned in the third post in this series that the physicists at Fermilab’s Tevatron and CERN’s LHC have been searching for the Higgs boson by looking for the tell-tale products of its different predicted decay pathways. The current standard model of particle physics is used to predict the rates of production of the Higgs boson in high-energy particle collisions and the rates of its various decay modes. After subtracting the ‘background’ that arises from all the other ways in which the decay products can be produced, the physicists are left with an excess of events that can be ascribed to Higgs boson decays. Now that we know the new particle has a mass of between 125-126 billion electron-volts (equivalent to the mass of about 134 protons), both the calculations and the experiments can be focused tightly on this specific mass value. So far, excess events have been observed for three important decay pathways. These involve the decay of the Higgs boson to two photons ( H → γγ), two Z bosons (H → ZZ → ι+ι–ι+ι–) and two W particles (H → W+W– → ι+υ ι–υ). You will notice that these pathways all involve the production of bosons. This should come as no real surprise, as the Higgs field is responsible for breaking the symmetry between the weak and electromagnetic forces, giving mass to the W and Z particles and leaving the photon massless. The decay rates to these three pathways are broadly as predicted by the standard model. There is an observed enhancement in the rate of decay to two photons compared to predictions, but this may be the result of statistical fluctuations. Further data on this pathway will determine whether or not there’s a problem (or maybe a clue to some new physics) in this channel. But the Higgs field is also involved in giving mass to fermions (matter particles, such as electrons and quarks). The Higgs boson is therefore also predicted to decay into fermions, specifically very large massive fermions such as bottom and anti-bottom quarks, and tau and anti-tau leptons. Bottom quarks and tau leptons (heavy versions of the electron) are third-generation matter particles with masses respectively of about 4.2 billion electron volts (about 4 and a half proton masses) and 1.8 billion electron volts (about 1.9 proton masses). These decay pathways are a little more problematic. The backgrounds from other processes are more significant and considerably more data are required to discriminate the background from genuine Higgs decay events. The decay to bottom and anti-bottom quarks was studied at the Tevatron before it was shut down earlier this year. But the collider had insufficient collision energy and luminosity (a measure of the number of collisions that the particle beams can produce) to enable independent discovery of the Higgs boson. If and when we see the Higgs decaying in these two [fermion] channels at roughly the predicted rates, I will probably start calling this new boson the Higgs rather than a Higgs. It won’t prove it is exactly the Standard Model Higgs boson of course, and looking for subtle differences will be very interesting. But it will be close enough to justify [calling it] the definite article. When will this happen? This is hard to judge, but perhaps we will have an answer by the end of this year. 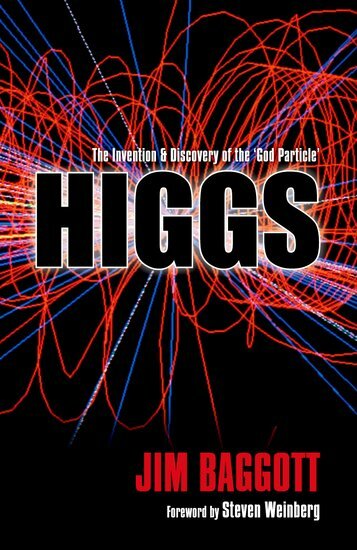 Jim Baggott is author of Higgs: The Invention and Discovery of the ‘God Particle’ and a freelance science writer. He was a lecturer in chemistry at the University of Reading but left to pursue a business career, where he first worked with Shell International Petroleum Company and then as an independent business consultant and trainer. His many books include Atomic: The First War of Physics (Icon, 2009), Beyond Measure: Modern Physics, Philosophy and the Meaning of Quantum Theory (OUP, 2003), A Beginner’s Guide to Reality (Penguin, 2005), and A Quantum Story: A History in 40 Moments (OUP, 2010). Read his previous blog posts.